CSY has more than 30 years experience developing and delivering powerful retail systems to companies across multiple sectors. Vector EPOS from CSY has evolved with the ever-changing face of retail technology to keep businesses up-to-date with the latest ways to sell smart and bring business closer to customers. We have been developing our Vector EPOS system for more than 25 years. We work closely with businesses to ensure our system gives them the best possible features, to make transactions, managing stock and identifying customer trends, easy. Find out more on what our system has to offer, including a breakdown of its specific features. Take a look at some of the eCommerce websites we have created for our customers, which take advantage of the integration available within Vector. Find out more about the customer sectors we cover and how the different features of our system will help benefit your business. CSY Vector is a reliable and cost-effective EPOS system, an excellent tool for managing and increasing profits. It is designed for you. 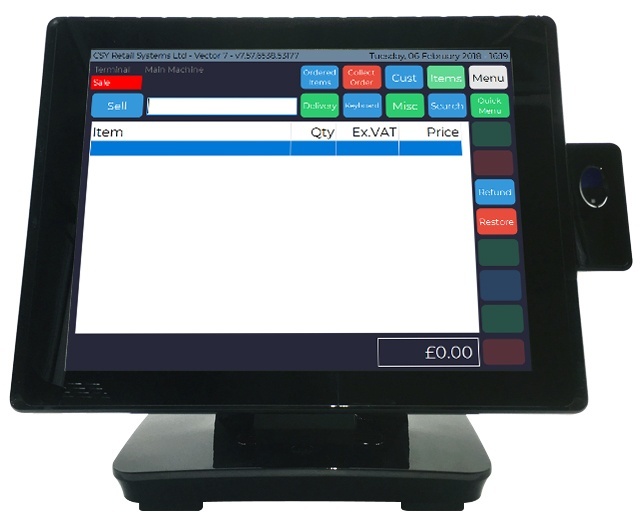 Whether you want to create your own touchscreen driven menus for non-barcoded products to personalise usage to your team, add specific features like electronic shelf edge labelling or weighing scales to suit how you need to sell, or automatically apply customer or team member discounts, you can with Vector EPOS. It offers integrated chip & pin card processing over broadband or fibre for faster transactions, security coded gift vouchers and an integrated loyalty scheme with bespoke-designed loyalty cards. CSY Vector EPOS can also provide a range of tools to make your EPOS system even better. We can provide handheld terminals, TabletPOS, and a range of label printing solutions as well as EPOS consumables. Backed by our in-house training centre in Nottingham and 7 day a week helpdesk, Vector is designed to give businesses all the support they need with sales. You can call our helpdesk 7 days a week or book a training session anytime. Vector EPOS isn’t just a smart platform, it looks great in your store too. The CSY DualPOS EPOS terminal provides the perfect platform for Vector. Pleasing on the eye and with a professional look, customers know your shop means business. It has an easy-to-use touch screen with all functionality laid out clearly for members of the team. CSY customers can get extra support and training, it’s easy to book a session in our dedicated training centre in Nottingham. In a world of big data, sales are more than just a transaction, it’s about business intelligence. Through Vector EPOS, businesses can see which products are popular, or not so popular with customers, who is visiting or buying on a regular basis and it can also help to reward loyalty, or attract customers to visit more often. Every sale you make tells you more about your customers.